anyone care to give a review of this circuit?... personal experience with it? This circuit, at least to the best of my somewhat limited knowledge, isn't based on another effect... I'd love to hear what everyone thinks. The description "booster with two complete circuits that can be mixed independently" let me thing of a clon centaur. You'll see, compared to the first draft, it really makes no difference to the overall layout, it's just true to the original PCB layout. Thanks Dino! Even for the Schumann Lion! If I'm correct the only part that has changed is around the Bypass "box", right? I've tried to reverse engineer a pedal once and I was getting a headache after 5 minutes! People think it's difficult to draw vero layouts! You did a fantastic job as usual. Thanks again(from all of us) for all the schematics you've drawn. If you look on the left side corners of the main PCB, you see the unused pads for the "Bypass" and "Env Out". Thanks again for this wonderful site, dedicated to us "veroheads". Viva la verolution!! I was going to make a pcb from the schematic but you saved me the hassle, cheers Alex. Can't wait to build it but still waiting for jacks. It sounds awesome and rich, very cool. Thanks. I don't understand why the Leds don't work. They are wired as usual to +12V. Did you add all cuts? Do you get + & -12V on the transistors' outputs? I'm trying different solutions. I erased all the issues by linking the 2 "LED+" together, to a wire out of the 2nd row from above (row under "+18 volt") and putting the "CLR" resistors on the "LED-" (between switch solder joint and LED-). I got some noises etc, doing this it works. Without leds the pedal works perfectly btw, for sure I have some weird problem with wiring these two. I should point out a discrepancy that the Schematic traced by Dino specifies a B1M pot for Drive. His layout does not have that pot listed on the BOM either, just VR1 and VR2.. But the schematic definitely shows B1M. Ok well I'm ordering stuff to build this while I wait for Dino's Lion X boards or layout. 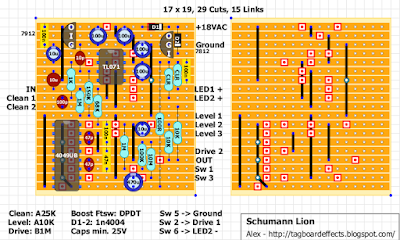 I'm going to use the 555 timer + and - 17 volt board and the second layout. I got a B1M and a B1K just in case hehe. Well I'll let you all know how and if it works since this is still categorized as unverified. I meant use the 555 18+ board and the first layout :P my bad. 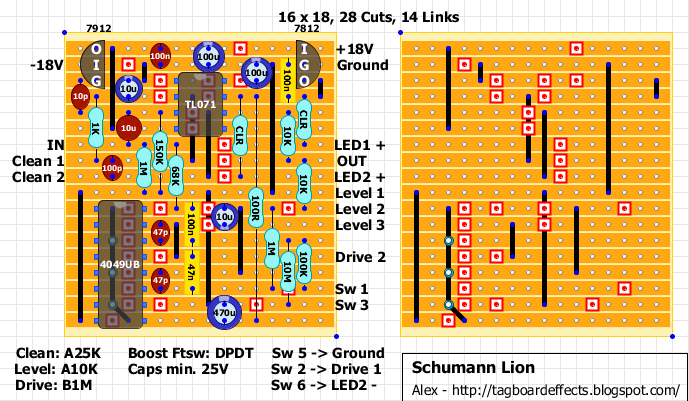 Alright so I've tried everything, read every schematic and it still sounds jacked up. BUT.. 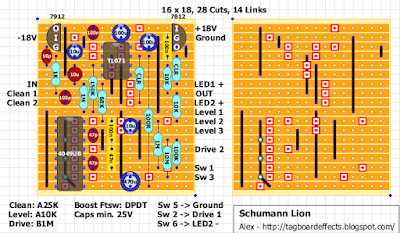 I've noticed some anomalies now that I have one of Dino's LEO-X boards... The Leo-X has a 470uf electrolytic between all of the 4049 common power nodes and ground.. A quick inspection of the Red Llama circuit.. has a 330uF electrolytic between the 4049 common power nodes and ground... Hmmm So when I get home from work today I'll hook up a 470uF and see if that takes care of the problem. It sounds bad without it. I also tried hooking up an actual 18V supply to the board to see if the daughterboard was just incapable of supplying enough current, that didn't help either. So this Electrolytic cap is my last effort before the garbage bin. More to come. If you're using a DC supply with the first layout then that's your problem. Top layout needs an AC supply as D1 will block DC so the 7912 isn't getting any voltage at all. It's not too difficult to convert your build to layout 2 so you can still save it. Well I changed it for the 18+ and 18- configuration using the bipolar supply, made a bipolar supply and then took it for a spin. It still had the weird flubbery droning octave down decay in boost mode. So I soldered in a 470uF electro after the 100r and to ground... Boom works like a dream. It's great. Changed the Drive pot value and added the 470uF cap.